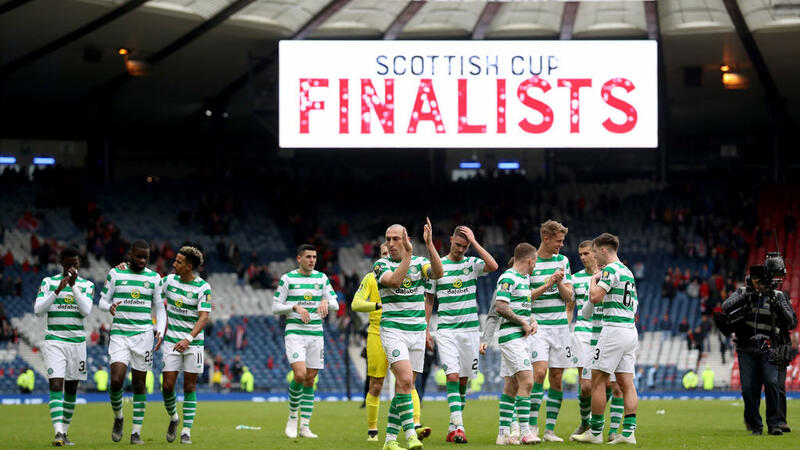 Celtic's hopes of a third successive domestic treble is firmly on course after they cruised into the Scottish Cup final with a 3-0 win over an Aberdeen side that imploded on Sunday. Goals by James Forrest, Odsonne Edouard with a penalty and Australian Tom Rogic gave Neil Lennon's team an easy passage into the final where they will meet Hearts, who beat Inverness 3-0 on Saturday. However, Aberdeen will have only themselves to blame for not offering more resistance as both Dominic Ball -- sent off for a terrible aerial challenge on Ryan Christie who had to go off and was given medical attention in the dressing room -- and Lewis Ferguson were red-carded for ugly challenges. The coaching staff too felt the wrong end of the officials' tongues too as manager Derek McInnes and assistant Tony Docherty were sent to the stands in a day that the club will want to forget very quickly. Forrest's excellent goal sent them in at half-time 1-0 up and the ideal launching pad for their dominant second-half performance although it was Ball's 36th minute dismissal that turned the match. "The red card settled us and we got the goal. Thereafter we were well in control of the game," Celtic midfielder Callum McGregor told BBC Scotland. "James (Forrest) is a top player and he can produce moments like that when games are tight and it shows what a special player he is." McGregor said the league title remained the priority -- they are 11 points clear of bitter rivals Rangers -- and the second part of their treble ambitions. "It will be a very tough game against Hearts, but that will be in the back of our minds," he said. "We have two massive games to secure the league title." "He took a real sore one, you could see by the length of time he was down it's a serious one," said McGregor. "He was in just getting assessed at half-time by the doctor, so I think he was okay, but they need to take their time and make sure he's okay properly."